L’eau à la bouche is a delicatessen with fine french basics where you can stop by to have a coffee, a soup, a salad or whatever the daily menu will offers you. The atmosphere is warm and cosy on winters, and fresh and sunny on summer days. Go there for their cheese selection and for the smell of fresh coffee. Thing is, the place gets quite crowded on weekend (don’t even think to have lunch there on market’s days) but if you are looking for quality products and are a food lover that a place to stop by. Oh and their cakes as well are to die for! Whether you’re a Vampire, Werewolf, Sasquatch or something else entirely, you will find anything you need at the amazing and wondrous Hoxton Street Monster Supplies – yes you read that correctly. Besides, the Monster Supplies store is the only place in London (maybe in England??) where you can buy some Organ Marmalade, tubs of Mortal Terror or even jars of Thickest Human Snot! Everything about this gift shop is clever, cute and wonderfully themed! Recently voted ‘No. 1 Kids’ Shop in London’ by Time Out Magazine, all proceeds from this kingdom of sweets and knick-knacks, go towards funding The Ministry of Stories, a charity that runs creative writing workshops for kids in East London, accessible via a secret door in the shop. Buy their Cubed Earwax for a great cause! A London institution. 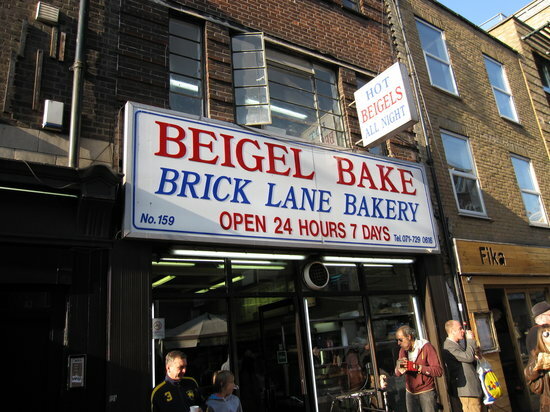 Beigel Bake is 24-hour bakery known for traditional Jewish-style filled bagels such as salt beef and smoked salmon. Are you going out in Shoreditch? Beigel Bake is the perfect take away before and after hangover. Nothing glamorous or trendy (that is the best part!) about the place but definitely the best bagels I’ve ever tried in London. If you are in East London with less than £5 in your pocket and pass by Brick Lane this is the place for you! The Gallery Cafe is a lovely charity-driven vegetarian and vegan spot hosting art exhibitions and events. Conveniently located in a great location; near a Boris Bike pick-up point, Victoria Park, Museum of Childhood, Bethnal Green tube station, Brick Lane and more, it’s perfect if you’re spending few hours in East London! During summer weekends, you can bask in the sunshine on the sun- trap terrace and back garden, whilst spending the rest of the year getting cosy inside the cafe with nice music, access to speedy wifi, and friendly faces. The cafe have won Best Cafe in Bethnal Green at the Time Out Love London Awards for the last three consecutive years. All profits generated by Gallery Cafe go straight back to charity. By hanging around, you’d not only enjoy award-winning food, drinks and good vibes, you’d also be helping to support the local community. The backyard is great on summer but the fresh vegan burger and home made fries are the reason why you should stop by! The place is charming and I warmly recommend it to you, vegan or food lover.